The Senate's 57-42 vote to confirm Mike Pompeo was one of the slimmest margins for the secretary of state job in recent history. Pompeo is expected to guide President Trump's foreign policy in a more right-leaning direction than his predecessor, Rex Tillerson. Mike Pompeo took over as America's top diplomat Thursday after being confirmed by the Senate and sworn in across the street minutes later. The new secretary of state immediately dashed off to Europe in an energetic start befitting the high-stakes issues awaiting him from Iran to North Korea. The hard-charging former CIA director was confirmed on a 57-42 vote — one of the slimmest margins for the job in recent history. Every past nominee to get a roll call vote since at least the Carter administration received 85 or more yes votes in the Senate, with the exception of Trump's first secretary of state, Rex Tillerson, who got 56. All voting republicans and seven Democrats supported Pompeo in the confirmation. Six of those Democrats are up for re-election. Democratic Sen. Tammy Duckworth, who recently gave birth, came to the Capitol to vote no. Republican Sen. John McCain is in Arizona and was the only senator to miss the vote. He was sworn in at the Supreme Court by Justice Samuel Alito, a fellow Italian-American, who said he was "proud" to officiate for the occasion. Pompeo, in a statement relayed by the State Department, said he was "delighted" to serve as America's top diplomat. "I am completely humbled by the responsibility and looking forward to serving the American people and getting to work right away," Pompeo said. Then it was off to Andrews Air Force Base, where a government aircraft was waiting to ferry him to Brussels for meetings at NATO headquarters. State Department staffers, demoralized after a tumultuous first year of President Donald Trump's administration, gave a round of applause to Pompeo, who responded as he boarded the aircraft with a casual, "Hi, I'm Mike." Pompeo, a former Republican congressman from Kansas, is expected to guide Trump's foreign policy farther to the right than Tillerson, the former Exxon Mobil CEO fired by Trump on Twitter last month. He inherits a State Department that has lost relevance under Trump and a diplomatic corps deeply dispirited by the tenure of Tillerson, who pushed budget and staff cuts and eschewed public appearances while leaving key diplomatic positions unfilled. His confirmation creates a vacancy atop the CIA that will be filled, at least for now, by Gina Haspel, the intelligence agency's No. 2 official. Trump has nominated Haspel to replace Pompeo, but she faces a rocky road to confirmation. The CIA said she took over Thursday as acting director while the Senate weighs whether to make it permanent. For Pompeo, a long list of pressing issues awaits, including a decision on the Iran nuclear deal, Trump's upcoming summit with North Korean leader Kim Jong Un and ongoing disagreements in the White House about the future U.S. role in Syria. Trump said he was pleased by Pompeo's confirmation, calling him a "patriot" with "immense talent, energy and intellect." "He will always put the interests of America first," Trump said in a statement. "He has my trust. He has my support." Yet the Senate vote followed an uneasy confirmation process for Pompeo that underscored Trump's growing difficulties in getting nominees in place for top positions. On Monday, it appeared Pompeo would fail a vote in the Senate Foreign Relations Committee, but the panel ultimately cleared him after last-minute support from Republican Sen. Rand Paul of Kentucky. 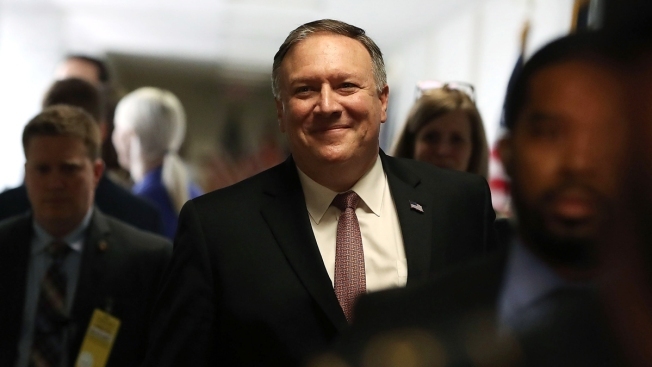 Previously confirmed for the CIA job, Pompeo was supported Thursday by all the Republican senators and by six Democrats, including several up for re-election in conservative-leaning states. GOP Sen. John McCain of Arizona, who is being treated for cancer, was absent. In the run-up to Pompeo's confirmation, his backers emphasized his resume as a West Point and Harvard Law School graduate and former congressman who enjoys a close relationship with Trump. Pompeo traveled to Pyongyang over Easter after being nominated for secretary of state and met with Kim ahead of the planned summit with Trump, expected in late May or June. "He's the perfect person to come in at this time and lead those efforts," Republican Sen. Bob Corker, who chairs the foreign relations panel, said on the Senate floor moments before Pompeo was confirmed. Yet his opponents warned that his hawkish foreign policy views and negative comments about gay marriage and Muslims made him ill-equipped to serve as a diplomat or to represent the U.S. on the world stage. Pompeo used his confirmation hearing to try to soften that image, edging away from past comments about regime change in North Korea. Pompeo takes the helm ahead of Trump's expected decision about whether to withdraw from the Iran nuclear deal by a May 12 deadline and reimpose sanctions on Tehran. A staunch Iran critic, Pompeo has long deplored the 2015 nuclear accord but has supported Trump's efforts to get European allies to strengthen restrictions on Iran. "If there's no chance that we can fix it, I will recommend to the president that we work with our allies to achieve a better outcome and to achieve a better deal," Pompeo said in his confirmation hearing. The State Department said no secretary of state had ever traveled abroad so soon after being confirmed. Originally, Deputy Secretary John Sullivan, who had been filling in as secretary since Tillerson departed, had planned to make the trip. With Pompeo's confirmation imminent, the plane was held on the tarmac until Pompeo could arrive and swap in. In Brussels, Pompeo will attend a NATO foreign ministers summit and meet with the top diplomats from Turkey and Italy. Pompeo planned to keep up pressure on NATO's European members, particularly Germany, to live up to their past pledges to boost their defense spending. From there, the State Department said Pompeo planned to fly to the Middle East for stops in Saudi Arabia, Israel and Jordan, where the future of the Iran deal and the conflict in Syria will be significant agenda items. Pompeo will arrive in the region ahead of a series of events that could potentially plunge it into deeper disarray, including the Iran deal decision and the relocation of the U.S. embassy from Tel Aviv to Jerusalem. Associated Press writers Lisa Mascaro, Mark Sherman, Deb Riechmann and Jill Colvin contributed to this report.